I think we all know what’s coming next. My oldest daughter has struggled mightily between her ethical desire to be a vegetarian, and her completely reasonable inability to part ways with hamburgers from The Counter, chicken drenched in orange sauce at the Chinese restaurant and delectable slivers of salmon sushi tucked into her lunch box. 1. No talking smack about the meat on the plates of others, especially in my house. 2. There will be no carbo-vegetarians here. With every meat you remove a protein or vegetable must be added to the diet. And so it began, midweek, with Tsorta Tfaya with Couscous. It is a medley of chickpeas and onions doing a darn good imitation of stew, with about half the ingredients. This was not a random choice. I wasn’t going to dive right in with tofu or sautéed broccolini, as a girl needs to warm up. Chick peas have just enough fiber and protein that it feels like a good wholesome substitute for meat. I lived for a brief period in Morocco, so this dish felt at once familiar and fresh. Further, since we’re talking weeknight cooking here, there is nothing more friendly than the words “can of tomatoes.” Yes it is better to use fresh vegetables, and dried beans while you’re at it, but it’s early April, it’s Tuesday, and you’re going to have this dish the way Kayb intended. We begin where all good kitchen stories do, with onions sautéing gently in butter and oil in a Dutch oven. Along come spices (so you don’t have any saffron or you’re missing something else, don’t sweat it -- just add a little more of everything else) and some harissa, which I have had on hand a lot longer than the Department of Agriculture would recommend. While that’s cooking up nicely, you can wash a pan or two, pour yourself a glass of something and commence with the sort of dinner conversation that begins with, “So, who can tell me what the Stamp Act was?” Watch the room clear. Wasn’t that your intent? Soon the chickpeas and tomatoes come along. Smelling good! Get that couscous going. It won’t be long. Rando m notes: Kayb is very excited to have us eat figs, but then never tells us when to add them. I substituted prunes, which I had on hand and prefer to figs in savory dishes, and threw them in when I remembered, which was in the last ten minutes of cooking. This was fine. I used vegetable stock for my couscous, to keep it real, but I used the Israeli type, so I had too much liquid. You’ve been warned – check the box. I found a heavy pinch of salt and a generous twist of black pepper finished this dish well. It was so fast, it was so easy, and the reluctant vegetarian, after proclaiming a dislike for onions and prunes, dove in. Did she polish it off like a burger? No. But she’s off to a good start. 1. Cut onions in half vertically, slice thinly, and saute in butter and olive oil over medium heat in a Dutch oven until soft. Add all the spices, the honey and the water, reduce heat to medium low, and simmer until the onion is well caramelized. Taste and adjust spices as needed. 2. When onion is golden brown, add chickpeas and tomatos. Simmer, covered, while making the couscous. 3. Bring stock to a boil in a small saucepan. Add couscous, ras el hanout, stir, and remove from heat. Cover and let steam for five minutes. Fluff with a fork. 4. To serve, put a serving of couscous in a wide bowl, shaping so it's higher at the edges. Put tfaya in the center. Garnish, if desired with slices or wedges of a boiled egg. I can't tell you how many times I've thought the same thing "We begin where all good kitchen stories do, with onions sautéing gently..."
Wonderful dialogue with your daughter. I think it is great that she is thinking about such matters and discussing them with her mom. Best of luck in your adventure together. I'm sure you'll both learn from each other. So good to see parents taking it in stride and respecting the tween/teen's wishes nowadays. Twenty years ago this conversation would not be happening. My son was vegetarian, along with me, before he was born. Harder than finding veggie food, was explaining back then that it was even possible to raise a vegetarian child. The proof is in my happy, healthy, 6'3" young man at age 19. He doesn't consider himself quite afull-fledged vegetarian anymore, but he knows so much about conscious eating and our food systems today. I revel in watching him get on his soapbox about CAFOs or processed or foods. May you both enjoy the learning and the teaching. This is something that both my husband and I have discussed. We eat meat, and when ever we eat with our 3 and 5 year old we really watch what we say; as in we are eating "meat". My son understands where meat comes from, we have explained the importance of feeding ourselves - like how a wolf eats when it is hungry and doesn't waste food. I appreciate a child's imagination as I do remember how I felt as a child staring at the turkey defrosting in the sink. To hear my son as he is gnawing on a lamb chop when my husband slipped and used the word lamb "who would eat a lamb that's crazy?". I have watched him not touch turkey and eat everything around it when he puts thought into a turkey; and yes I didn't say anything to him because well I understand. So when he asks me now I say lets just say meat and then we don't have to over think our food and enjoy it; which ya know it works for him so for the time being it works for my family. If it comes to it with either of our children I would make sure that they took themselves seriously in the choices of what they eat. I can remember when I was a cook up at a tree planting camp. I had the best vegetarians who taught me so much and I would always make a point of making them something similar to the meat meal. I do recall the very annoying picky eater "so called vegetarians" who would suffer through barley shepherds pie or chick pea stew - sorry no Kraft dinner here! You are so right what isn't there to love about a chick pea! Bravo to you for helping your daughter make smart choices while she decides what is best for her. I went through a similar phase in high school and although I didn't become a vegetarian, I learned how to be a thoughtful consumer. Incidentally, to Antonia and Ronda's point, in 9th grade there was one night a week when my parents both had work meetings so my Mom had me start cooking dinner for my brother and I. She eased me into it slowly - I made pressed sandwiches for the first month, then moved into boiling noodles, etc. It was kind of fun and over time I learned bit by bit. My brother and I had fun and once in a while, when my results were "inconclusive" (Read: burned), we treated ourselves to pizza delivery! 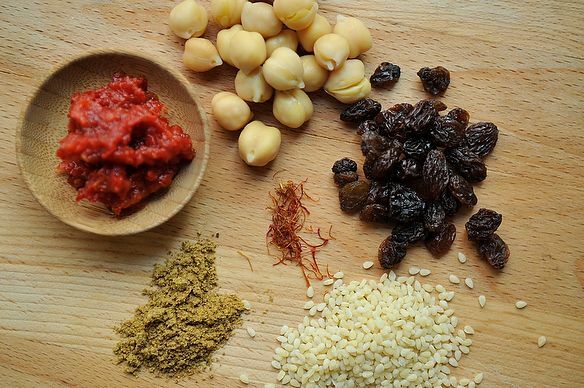 I was just wondering what kind of chickpeas and prunes you use...the prunes are as small as the chickpeas or are the chickpeas as large as the prunes? I used standard-sized canned chick peas and pitted prunes which are available both commercially and in bulk at Whole Foods etc. In the photo those are actually raisins, which were yet another alternative for the dates, or figs, or prunes! All would work well -- it just depends on what you like and what you have on hand. I see you may be confused by the photo here but those are actually raisins the prunes will indeed be larger. Yes, I noticed that they must be raisins after I read the list of ingredients listed. I usually photograph the ingredients that I actually cook with. Raisins would probably be a milder flavor, especially for a budding vegetarian. i enjoyed reading this a lot. i wish your daughter loads of luck. i also love how you told her no talking smack about meat on other people's plates! Jenny, the thing that's so great about your column (in addition to your fun writing style and lessons in cooking) is your snapshot into your family life and what that says about Family and the ways we raise children today. Clearly there's no recipe for that--we all just do the best we can to walk the fine line between letting them make choices and wanting to communicate our values--whether it's about, food, cooking, the environment, health...the list goes on and on. Those of us who participate in this forum (food52) do so because we care about food-- and it's clear that we demonstrate our love for our families in the ways that we feed them. Some of us are vegetarians, and some of us prefer not to be (or can't). All of us who have children know that each of our children presents us with unique challenges, and that no matter where they are as adolescents, they grow in such interesting and surprising ways. (My nephew, at around age 12, declared himself a "vegetarian except for hot dogs;" 15 years later he is a fabulous cook with a really sophisticated palate.) We really can't know if a preference stated by a given adolescent is real or not--we can just walk the fine line as you are doing with your daughter and as WinnieAb did with her son--doing our best to make sure that they are healthy, and doing our best to love our children exactly as they are. With your writing you give us a snapshot into your life--loving your children--trying to balance your needs and desires with theirs. It's what we all do, ultimately, every day. Thank you for sharing your life with us. This is such an incredible comment I almost can't do it justice with a reply. You have touched on what is wonderful about the food52 community -- people sharing their food and their lives, which are of course intrinsic, and ultimately, no matter our choices, facing the same central challenge -- to cook and eat well in a busy nutty world. Thanks so much for this comment and for being here! Jenny, your writing makes Mondays a treat. I am so glad to have you here! I am not sure I am ready to surrender the flame of my mercurial vintage stove to my 11 year old, but your point is well taken. She helps bake and with other basic cooking chores and she should be adding more to her plate, so to speak, you (and Rhonda!) are correct! I am going to make this tonight! Thank you! My mother used to tell the story about the Thanksgiving I declared I was a vegetarian, and ate only green beans for dinner. I gave up my stance about a year later. I'm sure none of you would be surprised to hear that the smell of bacon did me in. And then what did I do? Married a vegetarian. Now, I'm vegetarian half the time, and he's a "meat-reducer," eating the occasional chicken, lamb and pork. And I cook two meals a lot of the time. Regardless, fantastic to see the shout out for this recipe, Jenny. I had missed it, and now will be sure to give it a try. Thanks so much. Sounds like your kitchen is a very busy and entertaining place. Can't wait to hear if you make this! I think this sounds delicious - and might be even better with a few chunks of lamb or chicken thrown in! We'll try it the veggie way first, of course. Love your "can of tomatoes" comment! What can I say? I love me some canned tomatoes now and then!! Hope the dish works for you! Sounds yummy! Thanks, Jenny. I’m not a vegetarian, and neither are my kids, but I’m learning to be more mindful of (and thankful for) the animal that is slaughtered, before digging into my honkin’ fill-in-the-blank (burger, slab-o-bacon, leg-o-lamb, chicken, whatever.) Even go one step further and be mindful of the farmer who raised the animal, the grass that fed the animal, the sun that grew the grass, etc. etc. I know, corny, but it’s strangely meditative. Can you tell I’ve been reading up on my Buddhist relaxation techniques? It's the environment we are in, no? Brava to you for your two points made to your daughter. But I wonder -- why do parents cave into these unreasonable demands from their adolescent children? Vegetarianism is abnormal for humans. The "face" comment from your daughter points to the fact that she's not making an ethical decision at all, but a political and a social one, a decision to bend to someone (teacher? influential mentor?) who is putting pressure on her to make the shift, and to conform to her peers -- all the wrong reasons. So basically you are calling me, a lifelong vegetarian, as well as millions of Hindus who are vegetarian, abnormal. Way to be not only poorly informed, but condescending and nasty at that. I, along with my brother and every single one of my many cousins, was raised vegetarian and none of us are malnourished, unhealthy, or scrawny. Sure, at 5'4", I'm not the tallest gal, but that's the average height of the American woman and it so happens that I'm the shortest of all of my female cousins (because my dad is the the shortest in his family) - most of them are at least 5'7", which is considered somewhat tall for women. I've always had normal bloodwork, have never been anemic, and have always had low levels of cholesterol - same goes for all my family members. None of us have ever been overweight and it would be virtually impossible for any of us to be obese. Overall, we are in far better health than most Americans. I won't even bother getting into the environmental impacts of eating meat and how vegetarianism is much better for our planet. Bottom line here is that you should do a little more research into such issues before making inflammatory and uneducated statements. djgibboni - I don't agree that Jenny allowing her daughter to give vegetarianism a try is caving "into these unreasonable demands" from her child. Serving ice cream sundaes for dinner all week or buying a new princess dress every time it was desired would be caving into the unreasonable. Showing respect for a child's thoughts, concerns and sensibilities is a different thing altogether and I think it is quite wonderful. It seems to me that her daughter struggled with the decision for a while and really put some thought into taking the leap. The fact that she has agreed to stay within the limits that her mother set shows commitment. As a parent, you want your child to experiment, discover and begin figuring out who they are while they are still under your watchful eye. I am sure that Jen considered this - if her daughter is going to give vegetarianism a go, she can do it in a semi-controlled environment where her parents can guide her toward healthful, nutritious choices. I believe that forcing our children to eat what is put in front of them encourages unhealthy relationships with food and with family. I also think that AntoniaJames' suggestion is a great idea - her daughter's choice to go vegetarian gives Jen the opportunity to guide her on a secondary journey - her child, who is certainly old enough, can get involved in the actual menu-planning and preparation of the food. It will allow her daughter to take ownership for her choice and will also leave her with the wonderful gift of knowing how to cook, which will benefit her no matter what her dietary choices are in the future. I dealt with a similar situation a couple of years ago when my son was 8 and declared he would never eat meat again (on Thanksgiving, no less). It lasted 2 years...2 really long and annoying years, to be honest, because it was hard to get him to eat everything I thought he should be eating. Plus I personally don't think it is the best diet for growing children, esp. boys, so we fought. A lot. After a while, he realized he didn't feel all that great and he really missed meat, so he gave it up. He is no longer a veg now, but he is conscious about where the meat he eats comes from, and he's likes a lot more vegetables than most kids. Anyway, this dish is right up my alley- I love chickpeas and harissa and everything else in here...it sounds really delicious. I think so many parents face this. Either way, who doesn't love a chickpea? ?